3. 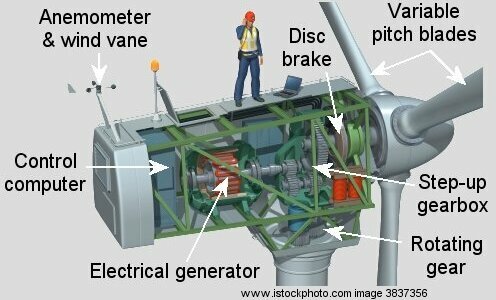 The wind turbine power-output profile. Wind power is an intermittent source of energy and whilst it is impossible to predict how much power will be available at a particular time, it is possible to calculate the percentage of time for which different levels of power can be expected. This is important as part of the planning exercise to determine, for example, what proportion of time you can expect the turbine to meet some particular demand level and how often it will need back-up power. 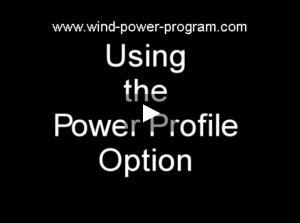 CLICK on the image below for a video on using the Power Profile Option in the WindPower program. When the Power-output profile option is selected from the menu bar, the default screen below opens up. The left hand pane shows the steady power curve for the wind turbine under consideration - a large 2.5 megawatt turbine is used in this example. It also displays the cut-in and cut-out speeds for the turbine. The pink box highlights the upper and lower bounds of the wind speed range under consideration. The position and width of this speed range window can be adjusted with the scroll bars in the right hand pane. The default opening screen sets the speed limits from zero to the turbine cut-in speed so that this is the period when the turbine is producing no power at all. 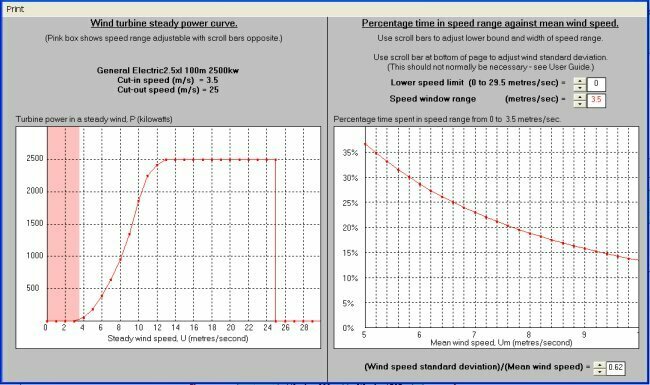 The graph in the right hand pane shows the percentage of time for which the turbine is producing no power as a function of mean wind speed. For the particular example in the figure, the graph shows that the turbine will not produce any power for about 30% of the time when the mean wind speed is 5 metres/second. However, at, say, 8 metres/second, this time is reduced to about 15% of the time. By using the scroll bars in the right hand pane, any speed range up to 30 metres/second can be selected in steps of 0.1 metres/second. The upper scroll bar changes the lower speed limit and the lower scroll bar adjusts the width of the speed range window. 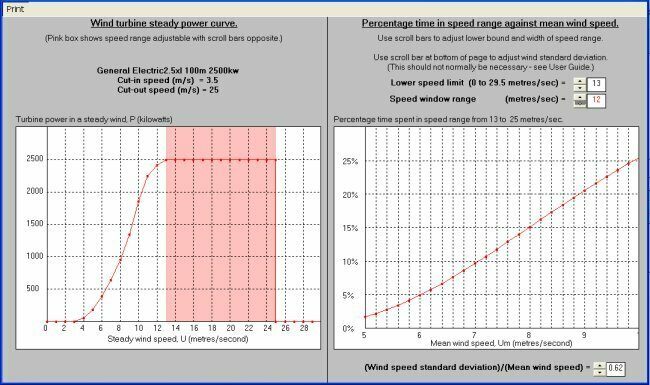 The figure below shows an example where the lower speed limit has been set to the rated power output speed (13 metres/second in this case) and the width has been adjusted to the cut-out speed (25 metres/second so that the speed range is 12 metres/second). Thus, the graph now shows the percentage of time for which the turbine is producing its full rated power output. At a mean wind speed of 5 metres/second, this is just under 2% of the time whereas at 8 metres/second, full rated power is being produced for about 15% of the time. It will be noted that the scroll bars control the size and position of a wind speed range not a power range and so, for example, if one wanted to see the percentage of time that the turbine produced, say, between 1000kw and 1500kw, it would be necessary to adjust the speed range control bars to the speeds nearest to the 1000kw and 1500kw positions respectively. The graph shows that the turbine will produce power in this range for just over 10% of the time at a mean speed of 8 metres/second. Anyone interested in the mathematical details of how these percentage times are calculated should refer to web page 13 on wind speed statistics. The relevant section is at the end of the Web page. It will be noted that there is a menu option to print out the power profile results. 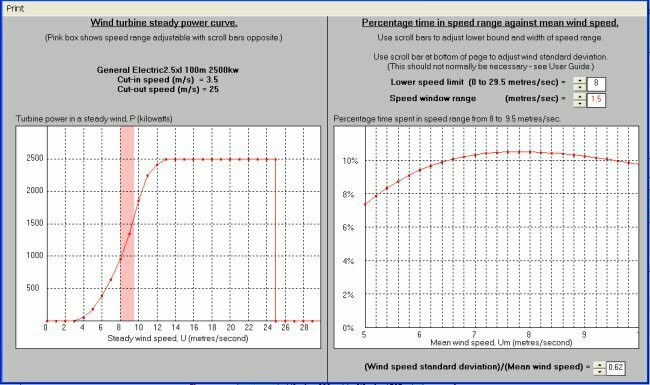 By adjusting the width of the speed range, it is possible to construct a power output profile for the turbine for different mean wind speeds. 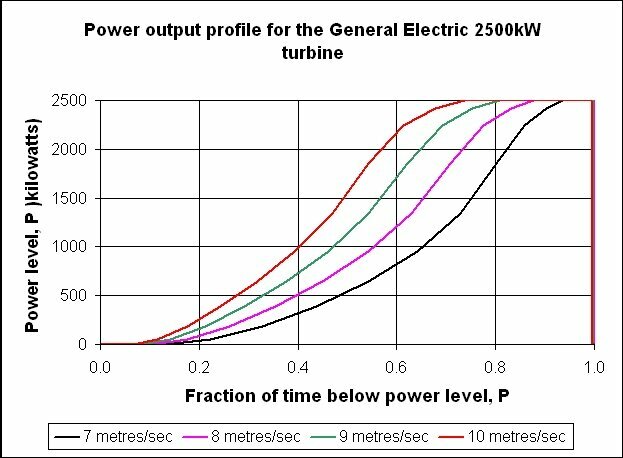 The figure below shows such a profile for the General Electric 2.5mW turbine for mean wind speeds of 7, 8, 9 and 10 metres/second. The graph shows the percentage of time that the turbine spends below different power levels up to its rated output. The time spent at zero output is shown by the values at 0 kilowatts - i.e. about 17% for 7 metres/second dropping to 9% at 8 metres/second. It is interesting to note that for 50% of the time, this large turbine would be producing less than 600 kilowatts at a mean wind speed of 7 metres/second whereas it is less than 1600 kilowatts at 10 metres/second. Next, a comparison will be made between the mean power output predictions of the WindPower program with field data for a large 2 megawatt turbine.